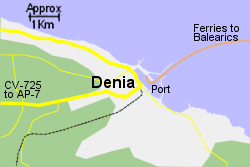 Map of the Denia Ferry Port area. 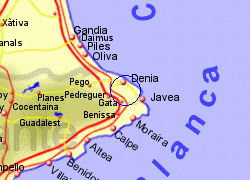 The small ferry port at Denia is the nearest to the Balearic Isles, being just 95 km from the west coast of Ibiza. 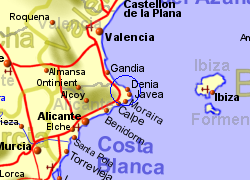 There is no main train station near Denia (the Euromed line runs inland at this point) but within 200m of the port is a station for the narrow gauge train that runs between Denia and Alicante (the whole journey taking over 2 and a half hours). The AP-7 motorway (toll) is approximately 8km from the port giving good access to the Mediterranean coast north and south. 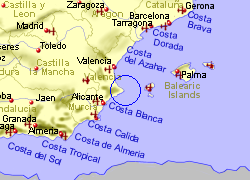 The journey north to Valencia takes just over an hour (105Km), with the journey south to Alicante taking a similar time (95Km). Operated by Balearia with up to 7 crossings per week, crossing time 8hrs. Operated by Balearia with up to 10 crossings per week, crossing time 2.5 hrs. Operated by Belearia, up to 13 crossings per week, crossing time 2.5 hrs.